Indian Prime Minister Narendra Modi’s visit to Washington, DC, in June garnered little public attention outside of India. Yet diplomats and military professionals in Asia and beyond were certainly watching closely. For good reason: the rapprochement between the world’s two most populous democracies could shape the world’s future. It is worth noting that in his address to the US Congress , Modi invoked the word ‘partner’ or ‘partnership’ no fewer than 15 times. The official joint statement  released by the two governments described India as a ‘Major Defense Partner’ of the United States, eligible for advanced technologies with military applications. The relationship between India and the US has evolved from one of cool distance to strategic proximity in a generation—lightning fast for geopolitics. The factors underlying this shift merits attention, for many of them are likely to bring the two countries even closer. The Cold War’s end was a significant part of the bilateral rapprochement, because it eliminated the possibility of India’s continued association with the Soviet Union, as well as its rationale for embracing non-alignment. A second factor is Pakistan. For a long time, the US pursued an even-handed policy toward South Asia’s two most strategically important countries. Nonetheless, during most of the Cold War, Pakistan was seen as a friendly country, whereas its great rival, India, was viewed as difficult. This view was reinforced when Pakistan became the essential conduit of weapons to Afghans fighting the Soviet occupation of their country. But the bond between the US and Pakistan weakened when Soviet forces withdrew from Afghanistan in 1989. Relations suffered further from Pakistan’s development of nuclear weapons, its provision of sanctuary and support to the Taliban, and its willingness to extend hospitality to some of the world’s most dangerous terrorists, including Osama bin Laden. As a result, US ties to India were no longer constrained by fear of complications in Pakistan. China is also animating the improvement in India–US ties. The motivation is far more fundamental than the fact that India and China still have an unresolved border. China’s rise has created a strong incentive for countries with a stake in Asia to increase their cooperation with the US, as well as with one another, to ensure that they can stand up to China’s political, military, and economic might. Domestic politics also loom large in the relationship’s development—on both sides. The decline of India’s Congress party reduced the influence of the political force most associated with maintaining distance from the US. Meanwhile, there are now more than three million Indian-Americans, and, as with many other immigrant populations, they have become ever more prominent and powerful. Supporting closer ties with India has become a rare example of bipartisan US foreign policy, and it can be expected to continue regardless of which party controls the White House or Congress after this November’s elections. The breakthrough in bilateral ties came a decade ago, when the US lifted sanctions introduced in response to India’s nuclear weapons program and then signed an accord paving the way for US involvement in India’s civil nuclear energy program. India, unlike both Pakistan and North Korea, is seen as a responsible nuclear power, a country the US now supports for membership in various groups designed to stem the further spread of nuclear materials and weapons. Economic ties are also growing, along with India’s economy. Bilateral trade has increased to more than $100 billion  a year. High-level visits have become commonplace. Closer economic ties and large-scale collaboration on clean energy are a high priority. One can also predict increased cooperation between the two countries’ military and intelligence establishments. Indeed, joint efforts to keep the Indian Ocean open and safe are already a reality. The US and India need not be formal allies for their relationship to have the desired effect on Chinese strategic calculations. Challenges remain, of course. Bureaucracy, corruption, and poor infrastructure continue to hold back India’s economy. Indian leaders must also be careful not to do or say things that could alienate the country’s large Muslim minority. And they must still ensure that close ties with the US are not simply the policy of one prime minister or party. This means getting the Congress party fully on board and overcoming the resistance of career officials to new ways of thinking and acting. It is difficult to overlook the irony in much of this. More than a half-century ago, in the early years of the Cold War, many in Washington saw India as a potential model of non-Communist political and economic development. For many reasons, things did not work out that way, as India became economically statist, for a time politically authoritarian, and geopolitically closer to the USSR than US officials liked. Now, however, India is emerging as a successful example of a market-oriented democracy with close ties to the US. 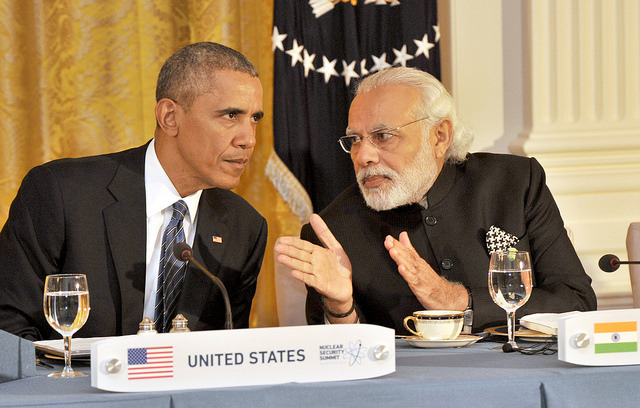 Second chances are rare in life, but both India and the US may be getting just that. Richard N. Haass, a former director of policy planning at the US State Department, is President of the Council on Foreign Relations. His next book, A World in Disarray: American Foreign Policy and the Crisis of the Old Order, will be published in January 2017. This article is presented in partnership with Project Syndicate © 2016.